I think over the four years my favourite column has been when I wrote ‘how not to sub a novel’ where I shared with readers my ridiculous (but true) letter that I wrote to agents - when I first started out as an author. As a writer you need a thick skin, and I’m more than happy to make fun of myself, or be honest when I’ve made a mistake, as I think that’s a great way for others to learn what not to do! 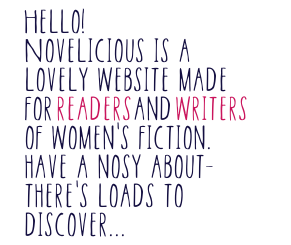 I love writing for Novelicous, not only is it a lovely supportive community of ladies that work for the site, but it has such a loyal following within the bibliophile community. I’ve got to know so many lovely writers, bloggers, bookworms and authors because of it. Writing can be a really lonely pursuit, and sometimes you can get quite narcissistic and think that you’re going quite mad, so what I love is when people comment on my column telling me that they get what I’m saying. I think writing for Novelicious will always be special to me as it was my first big break in the writing world. I had been writing for a year and getting nowhere, and when I started the column it was such a huge boost to my confidence that I think that’s what spurred me on to try harder. It was during a column that I asked readers whether they thought I should self-publish and when people said go for it, I did. And when I finally got my publishing deal, one of the things that had really helped me was my author profile in social media - and that in a huge part was down to my Novelicious column. So for me, I’ll always see the site as the catalyst for my writing career - and for that Kirsty and team I will always be eternally grateful.